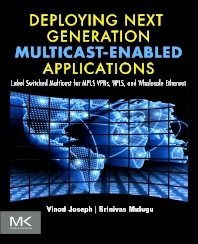 Deploying Next Generation Multicast-Enabled Applications: Label Switched Multicast for MPLS VPNs, VPLS, and Wholesale Ethernet provides a comprehensive discussion of Multicast and MVPN standards—next-generation Multicast-based standards, Multicast Applications, and case studies with detailed configurations. Focusing on three vendors—Juniper, Cisco, and Alcatel-Lucent—the text features illustrations that contain configurations of JUNOS, TiMOS (Alcatel’s OS), or Cisco IOS, and each configuration is explained in great detail. Multiple- rather than single-vendor configurations were selected for the sake of diversity as well as to highlight the direction in which the overall industry is going rather than that of a specific vendor. Beginning with a discussion of the building blocks or basics of IP Multicast, the book then details applications and emerging trends, including vendor adoptions, as well as the future of Multicast. The book is written for engineers, technical managers, and visionaries engaged in the development of next-generation IP Multicast infrastructures. works with Juniper Network as a Technical Leader within the Juniper Professional Services Organization. He is based in the UK and works with large Service Providers and customers with focus on the key areas of Network transformation, Multicast, QoS, Carrier Ethernet, Vendor Interoperability and Next Generation services. Prior to joining Juniper, Vinod worked as a Senior Network Consulting Engineer within Cisco’s World Wide Service Provider organization providing architectural design and service support to customers in the Asia Pacific and EMEA markets. This responsibility includes the planning and design of large network architectures, together with guiding deployment and providing operational advice. He has over 16 years of experience in IP networking, and built some of the largest IP/MPLS carrier networks in the EMEA, APAC, and America markets. Srinivasarao Mulugu heads the Packet division of Nokia Siemens Networks in India. He has over 17 years of experience in the telecommunication industry spanning across North America, APAC, Middle East and India. During the course of his career, Srinivasarao has worked in various capacities at Cisco Systems, Juniper Networks, 3Com and Sprint Communications. He is also active in the industry forums and has chaired several technology sessions in forums such as SANOG, APRICOT, etc. He has an MS in Electrical Engineering and an MBA, both from University of Maryland, College Park, USA. In his personal life Srinivasarao holds the position of Director Auromira Foundation and is involved in social welfare activities.